The "Eodromaeus" lived 230 million years ago and is the most primitive theropod known to date. A group of Argentine and American paleontologists discovered fossil remains found years ago in San Juan belong to a hitherto unknown species that lived in the Late Triassic, 230 million years ago, scientists reported. The species, named "Eodromaeus" is the most primitive of the dinosaur known to date among theropods, the lineage of bipedal carnivores that gave rise to birds, the paleontologist said Ricardo Martinez, one of architects of the finding. "Eodromaeus", the ancestor of some of the most famous dinosaurs such as Tyrannosaurus Rex or Velociraptor, "measured about 1.60 meters long, had the tail and neck very long, and weighed no more than 7 or 8 kilos, very light, the size of a turkey or so, "he said. This issue of the new species of dinosaur was found in Ischigualasto Park, also known as Valley of the Moon for its desert terrain in the San Juan. "Undoubtedly, this is a carnivorous predator, by the evidence it has on everything in the teeth: teeth are specially designed for cutting meat," said Martinez, who works at the Universidad Nacional de San Juan. "It is bipedal and, apparently, good runner, it is very graceful whole constitution of the skeleton, bones thin and very long," he said. Ischigualasto from 63,000 hectares in area, located some 1,150 kilometers from Buenos Aires, is one of the richest "fossil sites" in the world, where in recent years have found traces of the most primitive dinosaurs known . 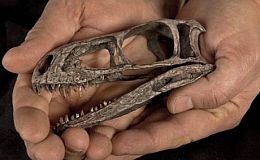 The scientist said that the remains of "Eodromaeus" were found in Ischigualasto in 1996, when they were cataloged as part of a species discovered in that park five years ago and called "Eoraptor." It was in 2000 when scientists realized that the remains, including an almost intact skeleton, which lacks only a few vertebrae, and two "pretty" complete, belong to another species, which led them to new research which results published today in the journal Science. It was thought that the "Eoraptor", discovered by Martinez in 1991, was a theropod, but thanks to this new discovery has found that in fact belonged to the sauropodomorphs, "the lineage that gave rise to the largest known forms of dinosaurs, "said paleontologist. The group of scientists who worked on Ischigualasto eventually find that the three major lineages of dinosaurs (theropods, and ornistiquios sauropodomorphs), of which remains have been found in the park, were more similar in their origins than previously thought. The "Eoraptor" were contemporaries of the "Eodromaeus", although they differed mainly by the shape of your teeth and the length of his vertebrae, which was higher in the latter case, the new species identified by scientists. In the Science paper presented to further argue that dinosaurs were more common and diverse than previously thought Ischigualasto area during the Triassic.